Last month, we went to New York Comic Con and I picked up a limited edition con-exclusive souvenir cold~ Since I still had to work at the convention, I spent most of the weekend medicated and quarantined behind Jordan & Joe’s table and nursing myself with tons of water and Taco Bell x KFC. Honestly, I think this was just my body keeping me from overexerting myself as I tend to do during bigger conventions; despite my stuffed sinuses, it felt pretty good to do New York Comic Con with a daily dose of 8+ hours of sleep and abstaining from alcohol and parties (during an average convention, I have a tendency to lose my voice by Saturday due to exhaustion, alcohol, and talking/screaming). Jordan and I took a bus to New York on Wednesday night and stayed at Lauren’s for the weekend. Much thanks to Lauren, Alex, Caitie, and Chicken for letting us crash in your living room! I didn’t get to take as many photos this year, but I did manage to photograph some amazing cosplayers for ComicsAlliance (my galleries are here and here). Speaking of photography, I want to invest in a new camera because I’m not crazy about my Nikon L120 – the quality of my shots with my Nikon are comparable to photos I’ve taken with my iPhone 5, which deters me from wanting to lug around this inconvenience of a camera on trips and adventures. I don’t know if maybe I just need to practice shooting with it more, but also, I’ve been using this camera for at least a few years. If any of you have any tips or camera recommendations, please hit me up~! 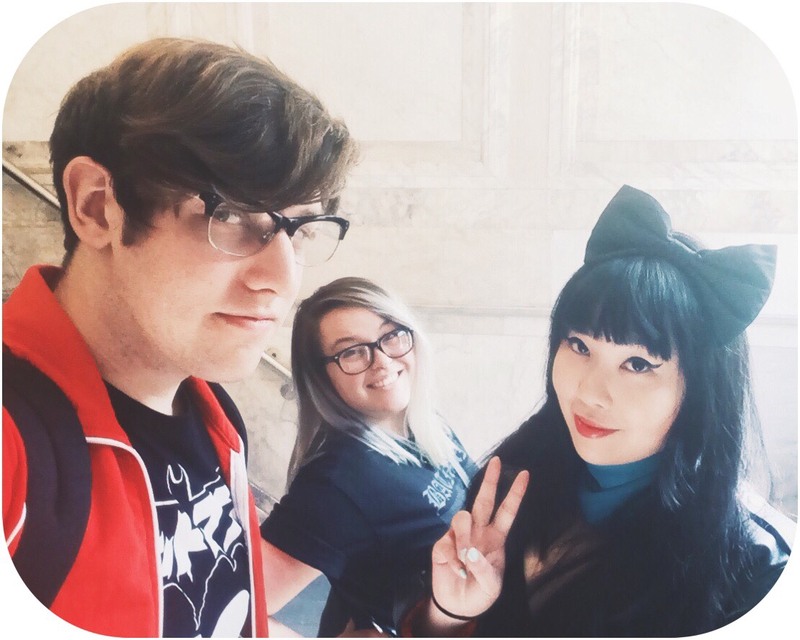 Did I ever post a convention recap of New York Comic Con 2014? Is it too late to post a recap of a convention that happened a year ago??? ANYWAY here are a bunch of photos from NYCC~~~! Lisa & my new MimoPowerTube~! Chicken made a new friend. Team JorJoe, hard at work. Hehe,awesome :D I'm so glad to hear they're cute in person!